The performance payoff is worth it. Put Nvidia's GTX 1050 into the Lenovo Yoga 720, and suddenly you have a laptop that can play games as well as it can crunch numbers and stream movies. The Lenovo Yoga 720 may look like a mainstream laptop, but underneath its mild-mannered exterior is a secret power: discrete Nvidia GTX 1050 graphics. It’s not a super-power—you can find gaming laptops with more powerful GPUs. Stuffing a discrete GPU into a laptop creates some compromises, too, especially in weight and thermals. Still, the Yoga 720 gives you some gaming chops for a reasonable price. Considering it’s also a 360-degree convertible, you’re getting a lot of versatility for the money. 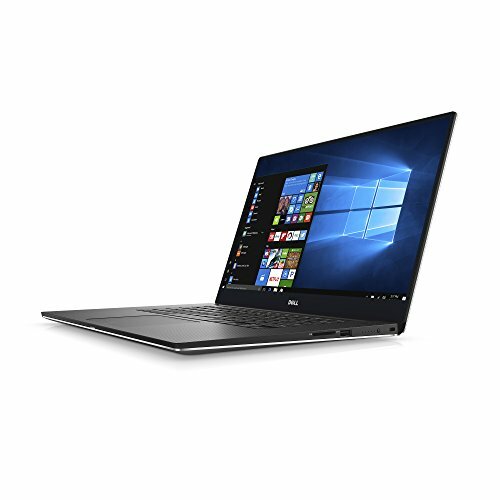 The model we tested (80X7001WUS) is actually on the lower end of the Yoga 720 product line at $1,260 as of this writing. Lenovo skimps here and there to keep costs down, as you’ll see when we go through the specs, but don’t judge it until you see how it performs in our tests. CPU: Intel Core i7-7700HQ. This is a fast mobile processor that you’ll also see in the premium Dell XPS 15. It’s a 7th-generation Kaby Lake part with four cores and eight threads, and you’ll see what they can do in our CPU-intensive performance tests below. RAM: 8GB of DDR4 2,400MHz. You’d have to shell out at least $90 more to get a 16GB model in this product line, and the single-channel memory may also be a slight detriment to the Yoga 720’s performance. The Yoga’s signature 360-degree hinge means you can use models like this Yoga 720 in any position from clamshell to tablet. Display: 15.6-inch FHD (1920x1080) LED IPS touchscreen with a 720p camera along the top bezel. This display looks crisp, but we measured the maximum brightness of our test unit’s screen at just 296 nits. This is enough for most situations (250 nits is a good level for indoor use), and it likely helped Lenovo shave off a little cost compared to laptops whose displays shine as bright as 350 or even 400 nits. If it’s any consolation, brighter display settings use more battery life. The Yoga 720 also comes in versions with a 4K screen. While that lofty resolution is always tempting, it’s important to note that such displays tax a laptop’s GPU and battery life. You can see the difference in our Performance section, where we compare the Yoga 720 to the 4K-equipped Dell XPS 15. The display can accept pen input, but a Lenovo Active Pen is not included with our model. The Lenovo Yoga 720 offers USB-C with Thunderbolt as well as the older USB-A. Storage: 256GB Samsung PM961 NVMe SSD. This is a good amount of storage on the nice, fast NVMe interface. Ports: Two USB-A Type 3.0 (5Gbps), and one USB-C Type 3.1 (10Gbps) with Thunderbolt support for display connection and fast data transfer. There’s also a fingerprint reader for authentication via Windows Hello. Weight: We measured the laptop at 4.55 pounds on our postal scale, a bit on the heavy side. But we’re not done yet: Add in the 6-cell, 72Wh, 135-watt AC adapter that goes with the discrete GPU, and weighs another 1.25 pounds, and you have nearly 6 pounds of hardware to haul around. Or just give up and keep it on your coffee table. 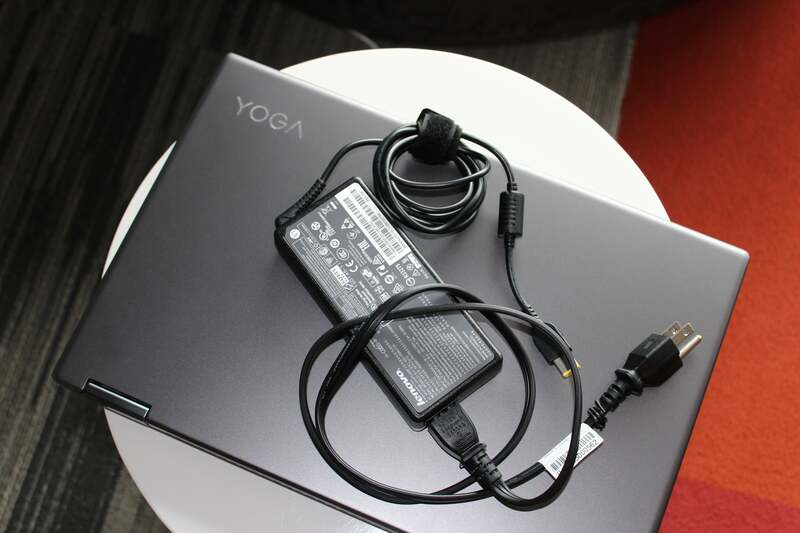 The AC adapter the Lenovo Yoga 720 needs to support its discrete GPU is bigger and heavier than you might expect compared to mainstream laptops with integrated graphics. Chassis material: The top and bottom are aluminum, in a matte finish of Iron Grey in our review unit. It also comes in Platinum Silver. The thick, 360-degree hinges felt infallible, and there was nary any flex between the two halves of the laptop. It’s hard to complain about a laptop with a big, crisp display. Everyday applications look great and have lots of room to spread out. Streamed movies show details you’d miss on run-of-the-mill screens. I even liked the audio quality, which I normally expect to be disappointing on laptops. In this case, the dual JBL speakers with Dolby Audio Premium seemed better than usual to my ears in clamshell mode, with the sound reflecting off my work surface. When I rotated the Yoga 720 into tent or tablet mode, the speakers were firing straight at me, and seemed nicely loud and vivid—not tinny and weak. 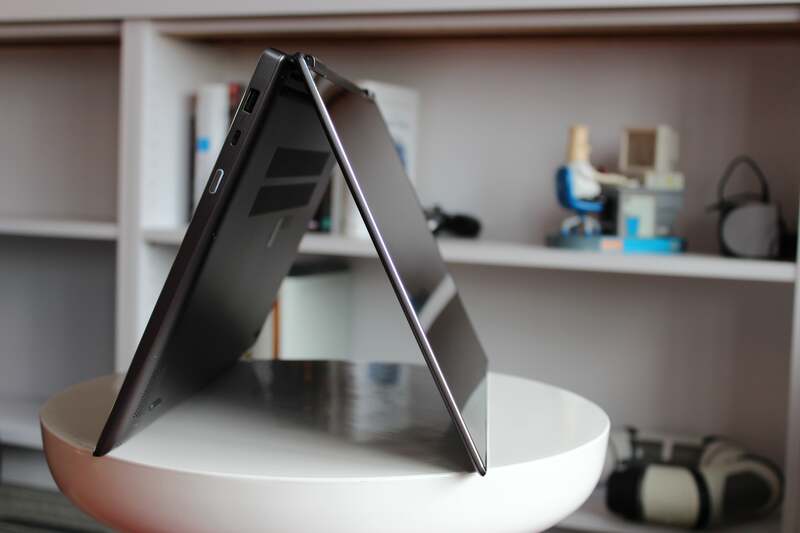 It’s nice to have that 360-degree versatility, but realistically the Yoga 720 is heavy for a tablet—I wouldn’t want to balance it for long in my lap, let alone hold it in the air. This is a machine you’ll most likely keep on a work surface in whatever configuration. The keyboard and trackpad on the Lenovo Yoga 720 were so smooth, my fingers kept sliding off. 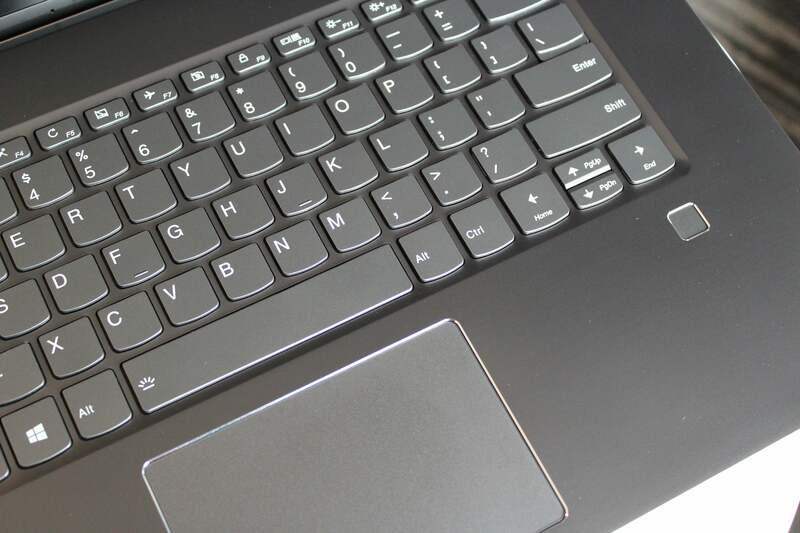 The keyboard and trackpad bugged me far more than I’d like, unfortunately. With surfaces as smooth and matte as the rest of the chassis, both components were incredibly slippery. I made all kinds of mistaken swipes and taps on the trackpad, and my fingers kept flying off the keys accidentally. The keys don’t have any concavity, which would have helped my fingers stay put. These components are the most subjective aspects of a laptop so I didn’t let these experiences scuttle the entire review, but if I were to buy this laptop it would be despite these two parts. It also must be said: When you get discrete GPU power, you also get fan noise and big vents. 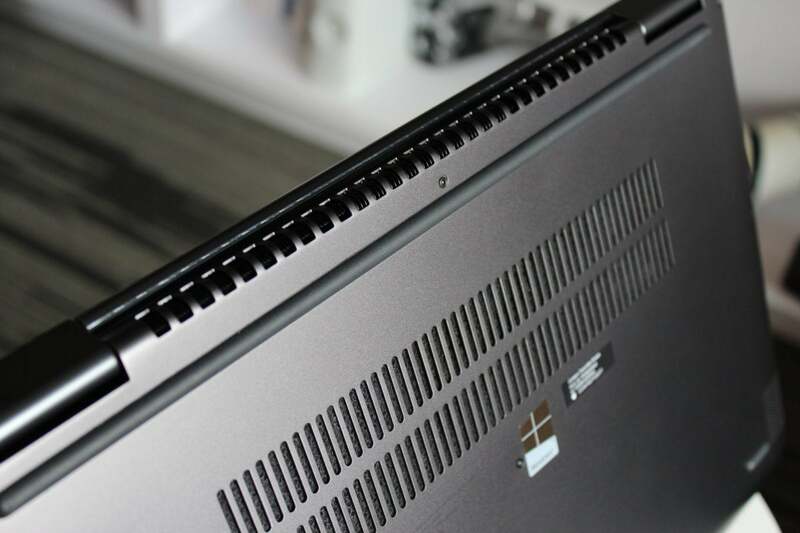 The Yoga 720 has a broad air-intake grille along the bottom panel, and hot air exhausts from an equally wide band of vents along the hinge. The fans kicked in frequently during testing and use. The volume was noticeable, and the hot exhaust could potentially feel uncomfortable if you were holding it as a tablet on the hinge side, or if you were balancing it on your lap. The Lenovo Yoga 720’s discrete GPU means it needs a wide air intake under the chassis, and an equally wide heat-exhaust array between the hinges. The Yoga 720’s thermal profile figured into its performance in our tests. We’re comparing the Lenovo Yoga 720’s performance primarily to that of the Dell XPS 15. They have the same quad-core Intel Core i7-7700HQ CPU and Nvidia GTX 1050 discrete GPU, but the Dell XPS 15 we reviewed has 16GB of RAM compared to the Yoga 720’s 8GB, and a 4K display compared to the Yoga 720’s 1080p. The XPS 15 is also a clamshell laptop design, rather than the Yoga 720’s convertible. This fundamental difference means the XPS 15 doesn’t have to worry as much about heat—no one’s going to hold it in their hands, as they might if they flip the Yoga 720 into tablet mode. We ran the relentless Furmark test on the Yoga 720 and recorded a top temperature after sustained activity of about 178 degrees Fahrenheit, which is tolerable. In our usual run of CPU-centric tests, the Yoga 720 did seem to be holding back to keep its cool. We also compared the Yoga 720 to the Samsung Notebook 9 Pro and HP Spectre x360. They resemble the Yoga 720 in their convertible designs and intended audiences, but they use the dual-core Core i7-7500U, and their GPUs, while discrete, are not quite as powerful. First up is PCMark 8 Work Conventional benchmark, which simulates everyday activities like web browsing, video chat, and document editing. It’s a good test for isolating the CPU’s role in everyday use. For context, any machine scoring 2,000 or above will sail along smoothly during these low-intensity tasks. The Lenovo Yoga 720’s PCMark 8 Work Conventional score of 3,135 is actually very good, but it falls behind the Dell XPS 15 and Samsung Notebook 9 Pro, likely because of thermal throttling. 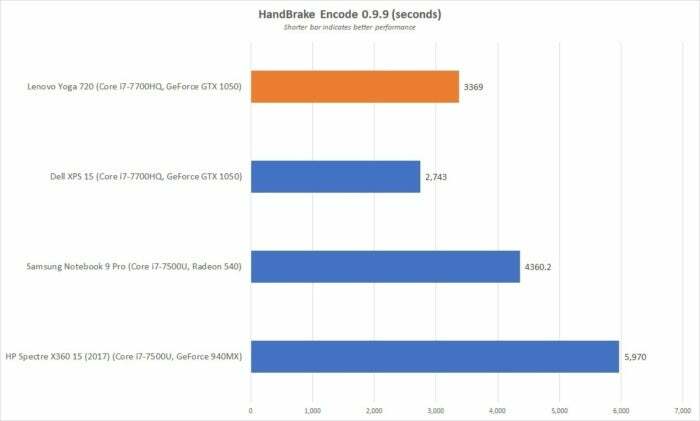 Given the Yoga 720’s quad-core CPU, this benchmark should be a walk in the park, and it posted a very good score of 3,135. Note, however, its lag behind both the Dell XPS 15 and the supposedly lower-powered, dual-core Samsung Notebook 9 Pro. This is likely due to the thermal profile we mentioned above. The single-channel RAM configuration, offering less available memory bandwidth for system tasks, may also play a role. Either way, it’s a fairly minor shortfall. 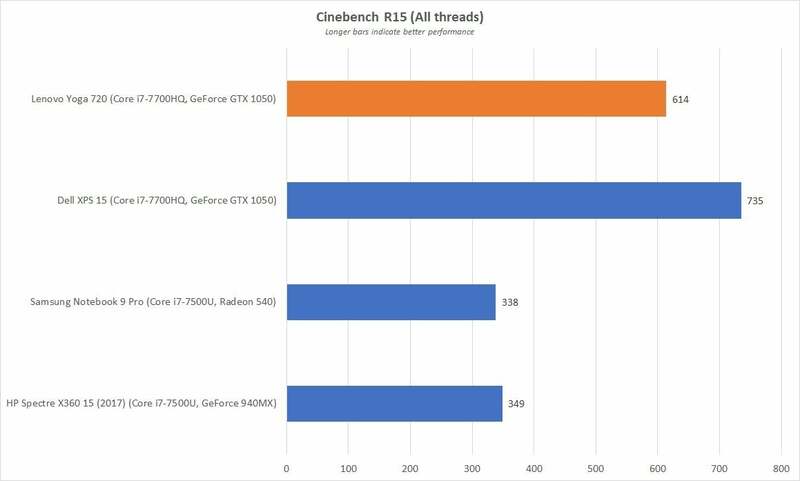 Another good CPU test is Cinebench R15, a free benchmark that measures a laptop’s ability to render 3D modeling. Most laptops finish the task in just a few minutes, so it’s a good approximation of how a system will handle brief moments of high processor utilization. Also, it loves threads, and you can see how that works out in the results. The Hyper-Threading in the Lenovo Yoga 720 (and the Dell XPS 15) shows its worth in the CPU-intensive Cinebench R15 benchmark. Lacking Hyper-Threading, the Core i5 laptops just can’t keep up. Thermal throttling once again held back the Yoga 720 a bit compared to the more traditional laptop design of the XPS 15. Still, both machines’ quad-core, Hyper-Threaded CPUs leave the dual-core Core i5s in the Notebook 9 Pro and Spectre x360 eating dust. Our last CPU-intensive test is the Handbrake encoding benchmark, which involves converting a 30GB MKV file to a smaller MP4 using the Android Tablet preset. It’s a CPU-focused test, and because of how long it runs, the results can also reveal how a system handles itself under heavy thermal load. The Lenovo Yoga 720 stayed within range of the Dell XPS 15, but thermal throttling likely kept it from a closer run. It’s no surprise to see the Lenovo Yoga 720 and Dell XPS 15 outstrip the Samsung Notebook 9 Pro and HP Spectre x360. Their quad-core CPUs are hard to beat. But the traditional laptop design of the XPS 15 maintains its edge over the convertible Yoga 720 and its constrained thermal profile. 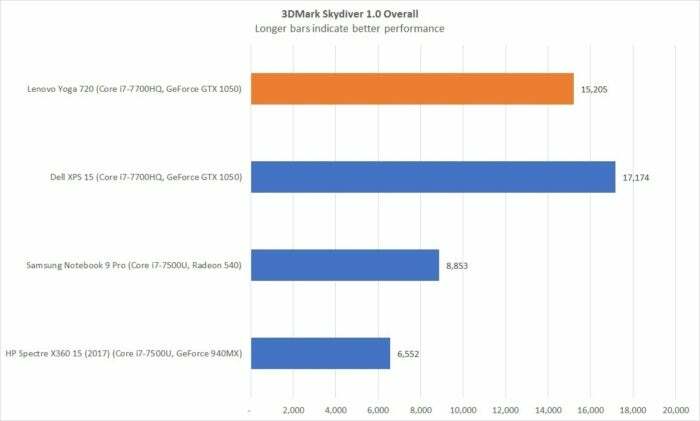 Futuremark’s 3DMark Sky Diver is a synthetic test that measures the graphics performance of a PC. 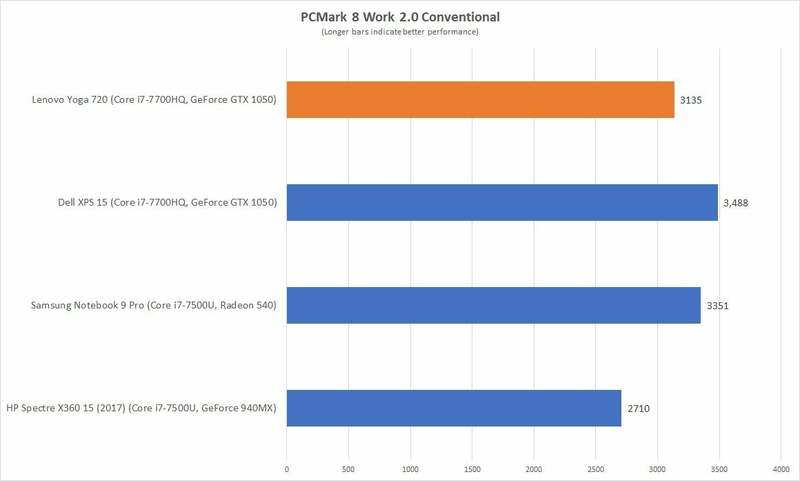 Although it doesn’t use an actual video game engine, it’s still well respected and clearly shows what you get if you opt for a discrete GPU. The GTX 1050 in the Lenovo Yoga 720 shows its might in 3DMark Skydiver, even with thermal throttling. The Lenovo Yoga 720 holds back a bit yet again, but it stays within sight of the similarly equipped Dell XPS 15, and they far outpace the Radeon 540 in the Samsung Notebook 9 Pro and the and GeForce 940MX in the HP Spectre x360. Before we dive into the battery life, remember that your mileage will vary. The way you use your laptop will affect its endurance, and some components can help—or hinder. For our test, we set the display brightness at an office-typical 250 nits and run down the battery by looping a 4K video, with a pair of earbuds plugged in and the laptop set to airplane mode. In the case of the Lenovo Yoga 720, its 72Wh battery is pretty big, but so is the appetite of its discrete GPU and quad-core CPU. It posted a good 7 hours-plus (426 minutes) of battery life—not nearly as long as the 9 hours, 50 minutes from the dual-core Samsung Notebook 9 Pro, but a lot better than the 5 hours, 31 minutes eked out by the Dell XPS 15. The Lenovo Yoga 720’s 72Wh battery managed a good 7 hours, 6 minutes in our battery test. The Dell XPS 15’s shorter time is likely due to its 4K panel, a useful caveat to keep in mind if you’re eyeing the 4K option on the Yoga 720. Blame the XPS 15’s shorter time on its 4K display, compared to the 1080p display on the Yoga 720. More pixels means more of a power crunch. 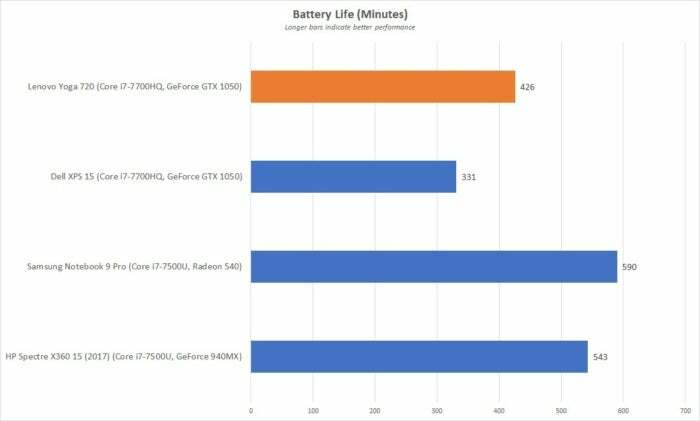 Keep that in mind if you decide to go for the 4K option on the Lenovo Yoga 720—your battery life will suffer. If there’s anything threatening mainstream-plus laptops like Lenovo’s Yoga 720, it’s the new generation of ultrabooks with Nvidia’s discrete GPUs and Max-Q technology. Max-Q laptops are supposed to give you the sweetest spot: gaming-ready graphics in thin, light PCs. However, Max-Q laptops are still a little rare and expensive. The Yoga 720 offers a decent serving of gaming power in a handsome package that doesn’t weigh or cost too much. If I can hate the keyboard and trackpad and still say it’s a good deal, that’s saying something. A flexible design, discrete graphics, and an attractive display make the Yoga 720 a versatile and affordable portable.